Head to Lens for its Louvre, then go off the beaten track to dig into Northern France’s UNESCO mining sites. If you’re a football or foodie fan, linger longer! If you love the Louvre art collections but at the same time feel daunted by the prospect of hectic Paris travel, you need to know that the Louvre has an impressive provincial outpost in the town of Lens (pronounced ‘Lonse’) in Northern France, a genius offset of Parisian pomp. Only an hour from Eurotunnel or the Calais car-ferry (and on the doorstep of Arras and Lille), the former mining town previously only known for its nearby commemorative war sites, now finds itself high on the hit-list of places to visit in France for a short break. Seen through a local lens - pun intended - here’s our cultural and foodie guide to Lens and its surrounding area. For a truly cultural holiday, include the Louvre-Lens on your list of places to visit in France: this is no regular museum! The sleek and minimalistic ‘Galerie du Temps’ arranges exhibits from Europe, the Near East, Egypt and India – both geographically and chronologically - in an extraordinary sense of zen-inducing light. Nothing is hung on perimeter walls, so works of art have a more three-dimensional, brought-to-life quality than conventional museums, with visitors weaving around artefacts, not past them. 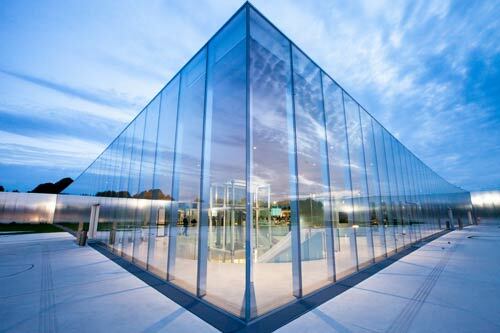 And as you’d expect from a cultural regeneration project, the Louvre-Lens also has an events arm (‘La Scène’) reaching out to the local community and visitors alike; its hugely varied programme of dates for the diary including dance, music, theatre and cinema alongside other events like banquets, picnics and workshops. With a recent marathon cutting right through the gallery itself, we think Lens has truly nailed the concept of an innovative and progressive Place to Be! The Louvre-Lens is built at the heart of former mining territory, and the surrounding area – the UNESCO-listed Nord-Pas-de-Calais Mining Basin – is awash with places of industrial interest including pits, railways stations, owners’ properties, mining villages etc. And every street hides a tale… For example Lens’ Rue de la Rochefoucauld may look like a regular street, but a closer inspection reveals an insightful social hierarchy with the grandest home at the pit end belonging to the mine’s engineer and a gradually diminishing status the further away from the pit you go: to the doctor’s house, the nurse’s, the teacher’s etc. The workers’ cottages nearby were designed with lengthy gardens – a managerial initiative to keep the occupants busy and away from the estaminets (local bars) where, it was thought, they would have had too much to drink and planned too many strikes! A shuttle bus or verdant 20 minute footpath takes you from the Louvre-Lens to Lens town centre. First off, weave your way through the typical French market - Tuesday and Friday mornings on Place du Cantin or Sunday mornings in Place Jean Jaurès. Peruse the latter’s perimeter to take in the precious art-deco architectural detail and also - whether or not you’re travelling by train - pop into the nearby locomotive-shaped art-deco Gare (station) where a series of cubist mosaics recount the gritty realism of miners’ everyday lives. 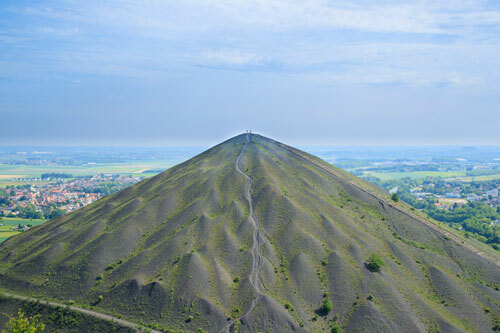 For a unique outdoor activity and photo opportunity, climb Northern France’s iconic pyramids! Now here’s something to challenge your definition of a landscape! Arguably the most emblematic image of Lens is the arresting sight of the twin ‘terrils’ or pyramidal slagheaps in Loos-en-Gohelle. They’re encapsulated locally in everything from snowglobes to pâtisseries and are even more intriguing when you discover that you can walk up one; tackling a terril to the summit is a bona fide outdoor activity around here, with many locals quoting the panorama as their very favourite view. If you’re a footie fan, you’ll no doubt be looking out for Lens’ Bollaert-Delelis stadium, host to many Euros ’16 matches and boasting more seats (38,000) than Lens citizens (33,000). Recalling a time when the region belonged to the Spanish Netherlands, the team plays in blood red and gold (and has a miner’s lamp as a motif). Join in the football frenzy at the match (buy your ticket from the ‘Emotion Foot’ shop or directly from the stadium), then grab post-match frites at one of the mobile vans known as baraques: miner’s son Jean-Paul Dambrine (or ‘Momo-la-frite’ as he is affectionately known) has been frites-feeding the fans for decades! Round off the day by celebrating or commiserating with the Lens loyals at a local bar; Chez Murielle, Le Maquis or La Mi-temps is where it’s at. Where to eat and drink like a local near the Louvre-Lens? Northern France is big on beer! It’s the traditional drink of Northern France so you’re more likely to see locals opting for a beer with lunch than a glass of wine. Look out for popular local beer Page 24 on menus and visit its passionate producer at the Saint Germain brasserie (brewery). 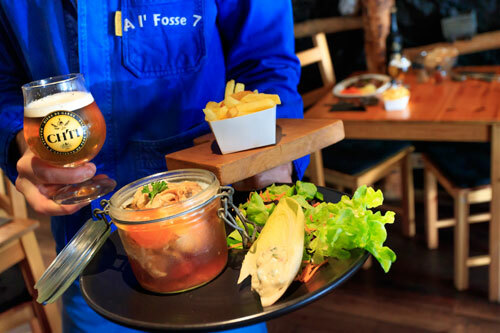 If a restaurant made to look like an underground coalmine sounds gimmicky, book a table at Al’Fosse7 in nearby Avion to find out that it’s anything but. With an emphasis on local produce and local cultural heritage (check out the mining artefacts, photos and playlist), this family-run, convivial eatery’s most popular dishes are regional specialities like Pot‘je vleesch (a combo of four cold meats served in a jar), Carbonade Flamande (beer, beef and onion stew) and the ubiquitous Welsh (melted cheddar over toasted bread and ham with a poached egg). Have fun decoding the light-hearted tone of the menu: some words are written exactly as they are pronounced locally! Locals also love the casual café vibe of a light lunch at L’Autre Estaminet (soups, croques monsieurs etc.) and for dinner recommend either wine-bar L’Etiquette (popular for its charcuterie and cheese sharing platters) or - for those looking to treat themselves - the Atelier de Marc Meurin restaurant in the grounds of the Louvre-Lens: modern cuisine, French savoir-faire and a sleekly modern décor in keeping with the museum. Hotel or Chambre d’Hôte? Where to stay in Lens? Search up tranquil chambre d’hôte (B&B) L’Arbre or the eco-lodges at Gîtes de l’Ecole Buissonnière. Or enjoy a luxury weekend break in the 4-star Hôtel du Louvre-Lens.